To what extent does the datum change as it spreads? On the trail of a quotation branded by Apple, attributed to Leonardo (thanks to Campari) and then found in a novel of the 1930s. A Latin adage that is still sometimes cited is “verba volant, scripta manent”, which is generally used to highlight how much easier it is to forget, or counterfeit, an oral message than a written message. The origin of the Latin phrase was instead a prudent and pragmatic invitation not to write everything that may come to mind, or at least not to write anything compromising, an invitation that unfortunately is not widely listened to today: one of the lessons I have learned in the work environment is its modern equivalent: “When you write an e-mail, always imagine it could be turned over to anyone”. Who among us does not resort to shortcuts when it is necessary to exchange confidential or simply embarrassing information? In past eras, the fact that spoken words fly while written words remain was also interpreted as an invitation to free words from the volumes kept in libraries and other austere stores and have them circulate. In this sense, the proverb has been turned around from an austere prudential prescription to an anarchic invitation to spread ideas and texts. Today, the interpretation of this proverb (whether it is right or wrong, it is the use that is made of it that determines the common feeling of phrases) is that writing is used to keep track of things, while spoken words can be easily forgotten, even deliberately, and it is much more difficult to prove that they were actually pronounced. A written text is instead a tangible object, which can be exhibited and inspected (the digitization of this statement opens up a world we will explore on another occasion). These somewhat trivial reflections, but also other more interesting ones that may originate from them, are only apparently a humanistic and philosophical daydream: they are very interesting when we bring them back to the contemporary form of information storage and dissemination. Do data fly or remain? Today, it is not just words that fly or remain, but more generally data, which can be texts, numbers, images, sounds and everything that can be replicated and stored digitally, so the proverb could very well be paraphrased as “data volant, data manent”. “Data volant” insofar as most data, consciously or not, are now published somewhere, on a blog, on a Facebook profile, on a Twitter account, in an unencrypted database, in the archives of a hacker who stole them from a bank and then published them on some site, in telephone recordings appearing in newspapers, etc. “Data manent” insofar as we have the impression that, once stored, data can no longer be extinguished: doubts and difficulties concerning the right to be forgotten are an example of this phenomenon. But is it really like this? In order to clarify ideas, I will give a simple example: let’s take the often quoted phrase which has been attributed to Leonardo da Vinci “simplicity is the ultimate sophistication”. Those who are interested in marketing and/or computer science know it well because it was already a slogan of Steve Jobs Apple in 1977. Now, it is somewhat difficult that this phrase could have been transmitted by oral tradition, flying from mouth to mouth, from Leonardo to the present day. 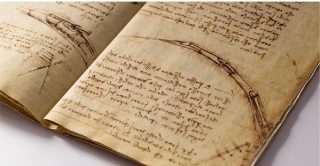 It can probably be found written in one of the many codes of Leonardo, that Codex Leicester which is now owned by Bill Gates, evidence of the extent to which the figure of the great Tuscan genius fascinates those who deal with computers. 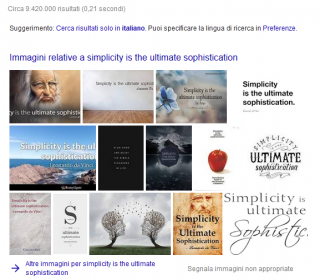 A check that many would make today is to search “Simplicity is the ultimate sophistication” on the Internet: this is the result given by Google (which now privileges images over texts). Once again, Leonardo da Vinci in first place! A slightly savvy user will take little to copy it, or even copy and paste one of the previous images on their Facebook profile, re-launch it on WhatsApp, launch it on Twitter and use it during aperitifs to show off their knowledge of Renaissance culture, perhaps adding a “verba volant” if someone asks them how they know it comes from Leonardo. Yes, how do we know? If the phrase belongs to Leonardo, as is said, it must appear in one of his codes, or perhaps in one of his biographies or quoted by someone who knew him, etc. The fact is that this phrase that wings it on the Web seems to have never taken off! We know it exists but not where it comes from, a very common fact for aphorisms, jokes (yeah, who invents them?) and fake news. 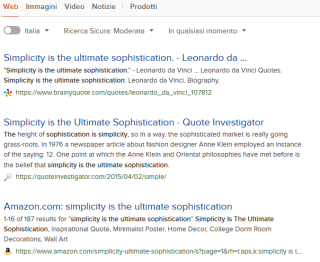 The second link reported by Duckduckgo gives us an interesting answer: in fact, it refers to the Quote Investigator site which analyzes quotations to find sources, attributions, precise quotes, etc. I will not deny the reader the pleasure of reading the answer and I limit myself to summarizing the conclusion: this phrase does not appear anywhere before 1931. It appears, in fact, in the novel by Clare Boothe Luce, U.S. journalist and diplomat who was also ambassador to Italy, entitled Stuffed Shirts: “The height of sophistication is simplicity”. So the phrase has nothing to do with Leonardo! However, what is more interesting to us is that it is written in a book of the 1930s, not a memorable masterpiece by a great writer but a book that is in libraries and was marketed in its days. What does this brief research tell us? To begin with, certainly that “verba manent“, as the phrase by Clare Boothe Luce, which could also have a previous source or be a sort of adage that was widespread at the time, has actually remained and come down to us. Too bad that as information it has been completely counterfeited: in fact, it is falsely attributed to Leonardo so it would not be strange to hear someone quote it as such in a conversation. So when data fly they also change? Exactly like words that pass from mouth to mouth, changing slightly at each step but completely distorted when they reach destination? Here the question is more subtle: in fact, in the information “the phrase simplicity is the ultimate sophistication is by Leonardo” we have a datum, the phrase itself, and a metadatum, its attribution. The datum does not normally change, if only because of the laziness of modern cybernetic amanuenses, who cut and paste more than copy. But the metadatum, which is nevertheless an integral part of the information, has changed, and with it the entire information built around the datum. Data remain and, moreover, can be manipulated in such a way as to make it difficult to trace back to their source and to the first person that actually manipulated them: “metadata volant, data manent”. For the sake of completeness, I should add that the first link between the phrase “Simplicity is the ultimate sophistication” and Leonardo dates back to 2000, when Campari paid for an advertisement in The New Yorker, the prestigious and cultured American magazine; in order to tie the goodness of its product to ‘Made in Italy’, it found nothing better than to cite the phrase in question and attribute it to Leonardo da Vinci. That one of the major English-language magazines of culture is involuntarily responsible for the spread of a fake quote, in addition to being very ironic, would make any intervention of a new Lorenzo Valla – who is greatly missed today – pointless. Dear data, how much are you really worth?